in recognition of the work we do with our MSF Rider Scholarship program. The Safety Council is a very important partner of ours in this effort. Finishing off 2009 with a great Christmas party at the Apple Hill Farm! All the way from San Antonio just to see her Red Kneck - um - Red Knight "dads." Lot's of memories in those pictures! Caught... on the back of an HD?! It may be November 29 but there were still bikes visiting at the President's house! It's Veteran's Day, November 11 but we're still riding! It's not very often that we are still on the bikes for our November Breakfast Club. 11/21/09 nine bikes came out for breakfast and a ride around the Quabbin. Temperatures ranged from 38 to 50... I'll take that for November! On our way for Apple Pie! Another great breakfast by the Jaffrey Firefighters to kick off Fire Prevention Week! Whose smooching on the beach? Our Tourguide Chris O. with a captive audience during a stop along Buzzard's Bay outside of Bourne. Rob Nelson, Randy Benn, Cliff, Stan Rolsky, and Bob with a "Red Knight" jet. Stan was a flight instructor for this plane in the 1960's. Annual Labor Day picnic brought out lot's of food. Caitlin has her first apartment (in Texas) and a RK "Apartment Warming" is on the way... what could it be? We had 30 members and another 10 or 12 friends that joined us in Nashua for our Labor Day Weekend cookout... lot's of fun and friendship to match the tons of food! Those are word written on the wall at Sherry's House in Worcester. After our visit with them on a rainy Saturday, words cannot express how we feel about the people that operate this building full of love in their support and caring for children with cancer and their families. Hmm, UNH and UConn have Dairy Bars (ice cream), UMass has a fruit orchard and fresh sausage for retail. Now all we need is a land-grant university-sponsored bakery and we'll ahve all the food groups covered for a road trip! RK Mass-13 is marketing a political T-shirt about trailering motorcycles! Mass-2 participated in this year's New Englnad Ride for Kids helping to raise over $44,000 for the Pediatric Brain Tumor Foundation. Our Chapter President was called to the stage during the post-ride RFK celebration and Mass-2 was recognized as one of the top five fund-raising clubs for the New England ride this year! We were out for a ride and ended up as the tail of a parade in Hancock, NH. They even announced us, the people cheered, and we waved! It happens every time Diona misses a ride. Someone catches Bob sitting on an HD! This time it was Mark & Leah's Fatboy. Heading across Lake Champlain to head up the west bank to the Canadian border on a perfect August day. We're patiently sitting here waiting for our guys so we can go riding! Rick O. with his new 2009 Titanium Goldwing. He called me to tell me that his and Lori's first ride on their new baby was for ice cream! ...but after Lori saw all the "extras" that were ordered with the bike Rick is down to eating bread and water until the Wing is paid for! Marcia got her own ride... specifically so she could go out for ice cream whenever she wants! Can you believe it? We got together to look at Americade Pictures and all this food showed up too! It's ice cream time again. 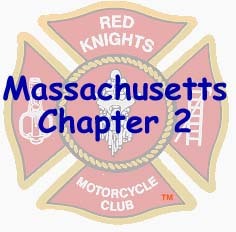 ...with friends from Mass-13 along for the ride! The lead bike in the area's Rolling Thunder Poker Run pulls into the final stop at the Orange American Legion. Off on our annual spring weekend. This year it was in the "quiet corner" of Connecticut. We made the obligatory donation at Mohegan Sun Casino, had a tour on The Nuclear Submarine the Nautilus at the Groton Submarine Base, had some good seafood at Abbott's Lobster at the Rough, enjoyed many miles (and of course ice cream) all from our "base camp" at the Plainfield Holiday Inn. Two Red Knights on the Tail of the Dragon! On our way to our April "Breakfast Club"
Our annual trip to Boston had seventeen people on board for the day... with lunch at Mother Anna's and dessert from Mike's Pastry! Our conductor was a great sport (as always) on the commuter train, and even got us all together in North Station and took our picture. March 28, 2009... it's nine weeks until Americade. There is still some ice on the lake with the occassional ice fisherman. almost empty! ... see you in Lake George in June! At work in the AFD kitchen preparing the meal for the Chapter Representatives at the RK State meeting. Represenatives from RK Chapters 1,2 3, 4, 8, 9, and 13 met in Ashburnham on Mach 21 to welcome spring and review Red Knights' business. Ed and Kevin took advantage of a warm early-March afternoon to hit the road. But if you look in the motorcycle trailer in the back of the picture you can see that Bob was already out when they stopped in Petersham! It was still cold (12 degrees) when we met for our February Breakfast Club but we still had fifteen members meet up! ...and the folks at the Kozy Kabin in Barre out did themselves! As always, we provided entertainment on the Commuter Rail and the submay. ...one rider stated to your president, "You must all be together!?" Lot's of bikes to look at... and after the winter weather we have been enduring it felt good to daydream about riding! And we topped the day with a late lunch at Mother Anna's. John was surprised to see us and we told him we were the scouting party for our April visit. Thank you to our hosts from the Curling Club for their hospitality (and patience teaching us their sport) --- and to Mary B. for keeping us fed!